The Terriers’ 2016-17 schedule features 34 regular-season games and two exhibition games. The schedule features 16 regular-season home dates, 22 Hockey East games and contests at Denver and Michigan, as well as at Fenway Park. 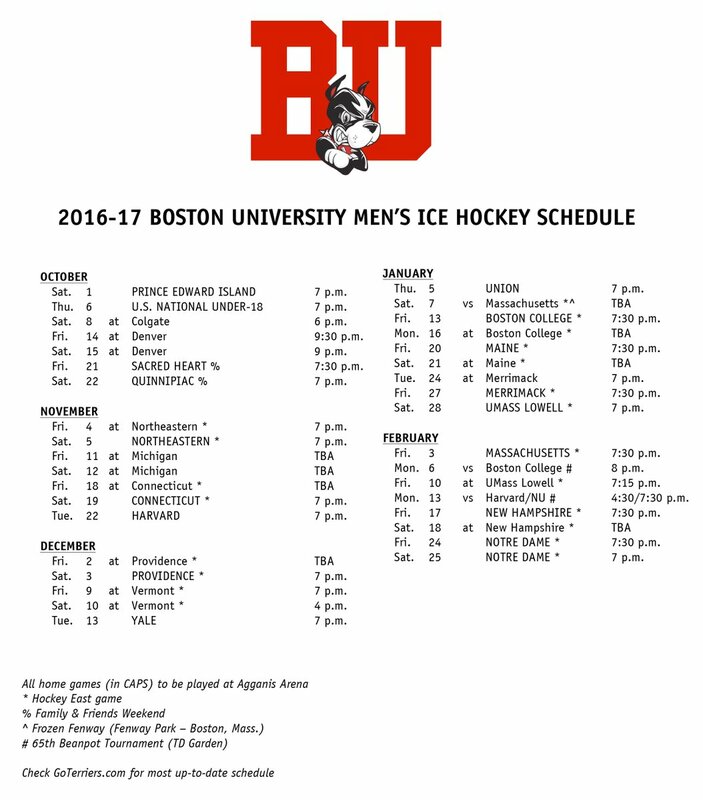 BU's regular season opener is three months from today, October 8, at Colgate in the Red Raiders' new Class of 1975 Arena. The final update of College Hockey Inc's list of college players at NHL Development Camps show 12 players on the 2016-17 roster and seven former Terriers. Former Terrier Sahir Gill has re-signed with the Penguins AHL affiliate, Wilkes Barre/Scranton, where he’ll again skate for former BU standout and U.S. Olympian Clark Donatelli. Gill scored 14 points in 21 games for the Baby Penguins last season. He’d begun the season with the ECHL Wheeling Nailers, scoring 18 points.